Create a high quality document online now! 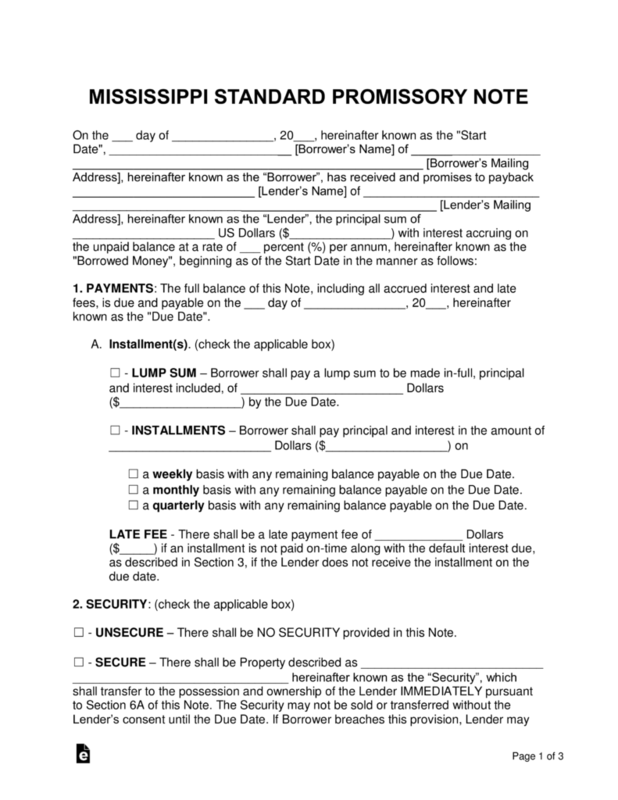 The Mississippi promissory note templates are documents that structure and organize the details regarding a loaned amount of money between two parties. Covered in the template are topics such as interest rates, payment types, late fees, and the parties’ personal information. The lender profits from the deal by earning interest on top of the original balance of the note. Secured Promissory Note – Protects the lender in the case of a default by allocating a possession of the borrower such as a home, vehicle, or boat to security. This item is guaranteed to the lender if the borrower cannot recover from the default. Unsecured Promissory Note – Includes all of the aspects of the secured version, but is different in the fact that there is no security section for the parties to complete. This adds considerable risk to the lender, as he or she is not guaranteed a return of the original balance if the borrower defaults on the note. Under Mississippi law, the legal rate of interest, unless otherwise agreed is 8% per year, although parties can contract in writing for an interest rate not to exceed 10% per year of 5% over the federal reserve discount rate, whichever is greater. Miss. Code § 75-17-1. Legal rate of interest; finance charges. Our support agents are standing by to assist you. Please be aware that our agents are not licensed attorneys and cannot address legal questions. © 2019 Electronic Forms LLC. All rights reserved.